Karen Shaw, left and her son, James Shaw Jr. at the reception honoring him at his alma mater, Tennessee State University. But as a mother to James, she also has concerns along with her appreciation of the outpouring of support. That outpouring has included $240,000 in donations to a GoFundMe campaign James started to help the families of the victims of the shooting, and appearances on national cable TV news. Shaw was honored at a Nashville Predators game, and, appeared on the Ellen DeGeneres show where he met his sports hero Dwyane Wade who donated $20,000 to the Go Fund Me Campaign and received another $20,000 from the show’s sponsor Shutterfly. The Steve Harvey Show announced it planned to send him on a trip to Barbados. Still Karen Shaw shows the steady focus of a mother for the long term health and well being of her son after the trauma of the initial event. 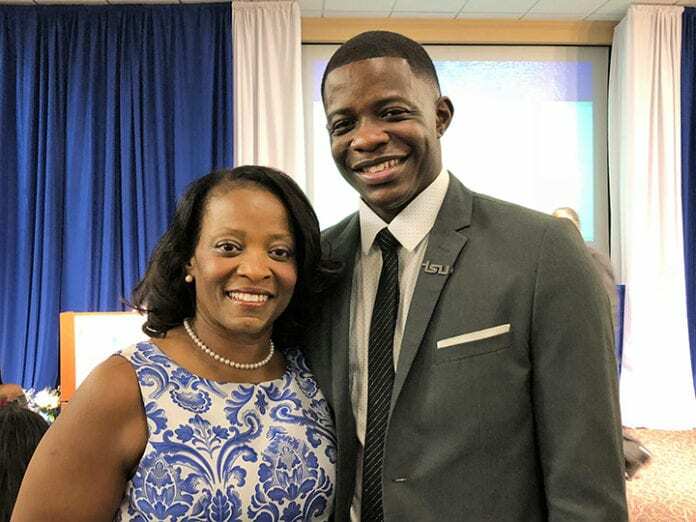 The accolades heaped on James Shaw Jr. may be gratifying to many, but to a family that seems to eschew publicity, his actions have only confirmed what they knew about the character and ethics of James Shaw Jr. And for Karen Shaw, that means cherishing and protecting her son’s well being.